Brakes are one of the most important parts of your vehicle. The factory braking system on most vehicles leaves a lot to be desired especially if you have increased the engine performance. Our brake upgrade options start with some specially engineered brake pads that provide excellent stopping power even at low temeratures thanks to our special carbon fibre based compounds. We replace the brake fluid with high performance fluid that has a much higher boiling temperature. 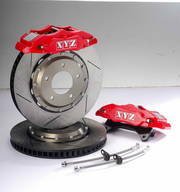 We also use slotted brake discs to help evacuate gasses produced during hard braking. The slots also resist brake pad glazing and tend to keep the braking system cooler which in turn helps to prevent the brake fluid from boiling under extreme use. These are available in 4 to 8 pot configurations for most cars including commercial vehicles.